I first discovered Excite Clothing over a year ago when I was searching on eBay for some reasonably priced shrugs. They had several different options available and all at low prices. Great – I love a bargain! They have now got their own website and the brand is going from strength to strength. Ranges include women’s, plus size and children. There seems to be something for every taste and prices are kept very low. I like many items on the website but I think my favourite is still the shrugs – at £5.99 for the plus sized ones they’re an absolute snip! 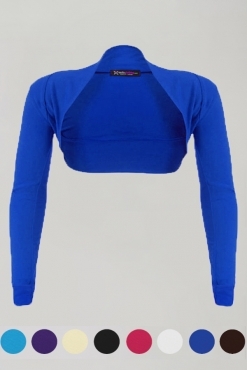 I adore the shade of blue of this shrug – so lovely! But I think I will need to get these in every colour available as my wardrobe is in dire need of more shrugs, particularly as the weather has turned cooler, but not cold, to help transition my summer outfits to winter ones. Excite Clothing have very kindly offered a £20 voucher to the winner of this prize draw as part of My Blog’s First Birthday Giveaway. Entering couldn’t be simpler. Just complete the tasks in the Rafflecopter below. I found Excite through Plus North. And became obsessed! I have 3 excite dresses now and hope to get plent more! I love the quality, and the shrugs are to die for! I'm absolutely gaga for the delicate floral cream dress. I don't own any dresses at the moment, and this one is just adorable. This was the toughest one! I can't pick a favorite! I'm in love with all those dresses! I love the DENIM USA FLAG PRINT SHORTS and the PINK SUMMER STRIPED A-LINE SKATER DRESS! Ooooh, also the PINK POLKA DOT BELTED SKATER DRESS. I love the shrugs and keep meaning to order some to wear with my dresses. I think that the Animal Print Leggings have to be my favorite. So sassy, they could complete the look for any little black dress, especially with a pair of black booties! I sure do love the shrugs as well! 😀 I don't have any, and I need that kind of things! Wow, they were tricky to find on facebook! I would go for a shrug, definitely! and a high waisted pencil skirt.